Earn up to 3,912 reward points. If you want a top quality reasonably priced Irish Tenor banjo, the Goodtime 17-fret Tenor is a real find. Made in America at the Deering Banjo factory in California, the Goodtime open back banjo weighs about 4 pounds so it is ideal for traveling, camping, hiking, and taking to the beach. It provides a vibrant singing banjo tone in any situation. Light enough to hold and play easily, it is the perfect banjo for beginners since it is fretted correctly and plays easily. The shorter 17-fret neck reduces the length of the entire banjo to just 32 inches end to end. Tuned in 5ths like a viola or cello (C,G,D,A), this banjo is a great crossover instrument for string instrument players of all kinds. 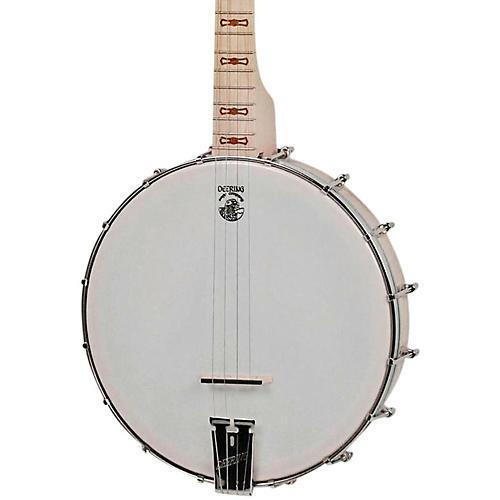 Order today and experience a friendly, easy-to-play tenor banjo.